In early 1919 Irish nationalist candidates who had been elected in the Westminster elections of 1918 by a massive majority refused to recognise the London parliament and instead established an independent legislature in Dublin called “Dail Eireann”. At its first meeting on 21 January 1919, 100 years ago this week, it adopted the Declaration of Independence and the Democratic Programme. 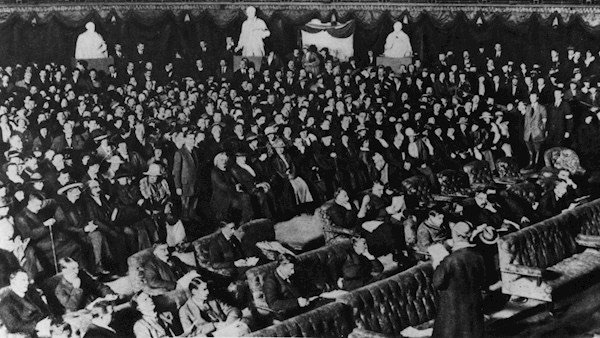 It was the first meeting of the parliament of the revolutionary, all-Ireland Irish Republic. Now, therefore, we, the elected Representatives of the ancient Irish people in National Parliament assembled, do, in the name of the Irish nation, ratify the establishment of the Irish Republic and pledge ourselves and our people to make this declaration effective by every means at our command. We declare in the words of the Irish Republican Proclamation the right of the people of Ireland to the ownership of Ireland, and to the unfettered control of Irish destinies to be indefeasible, and in the language of our first President, Padraig Mac Phiarais, we declare that the Nation’s sovereignty extends not only to all men and women of the Nation, but to all its material possessions, the Nation’s soil and all its resources, all the wealth and all the wealth-producing processes within the Nation, and with him we reaffirm that all right to private property must be subordinated to the public right and welfare.